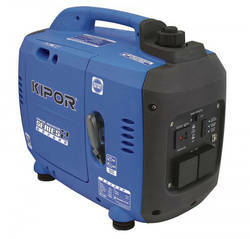 The 2.6kVA Kipor GS2600 portable generator is built with inverter technology, which means not only can you power mid-range power tools but you can power sensitive equipment like laptops, phones, and tablets. This set is quiet and compact. It weighs 29.5kg, making it transportable with a little bit of muscle. It's built with 12V DC x 5A and dual 240V x 15A outlets so you won't be short on options. A 1 year nationwide manufacturers warranty for domestic use will back you up if anything goes wrong. March 15, 2017 Had this 6 years and the only trouble I had was the carbs had to be replaced due to leaving fuel in it when stored. Very cheap online for new carry. Otherwise great for the price if you maintain it as per the manufacturers instructions. Big thumbs up from me. February 26, 2017 We purchased our GS2600 some 7 years ago. It has performed beyond expectations. We use it regularly motorhoming. I found it blew a little smoke till i changed to Honda Genset oil. Regular oil changes and operating it on a dirt free pad, board or shade cloth keeps it clean. An excellent piece of kit we cannot do without. Have owned my 2600 for at least six years now and has been a GEM since new!! I thought it may have had a bad choke but i discovered it was me not engaging it properly. I have nothing but praise for it and as I write this it is running as we are caravanning full time atm. The only improvement I could make is for the manufacturers to develop a fixing down kit i.e. for generator boxes on caravans and an exhaust extension kit to direct the exhaust gasses out of the gennie box!! Nothing but 5 stars from me! !